Why experiment on Peeps? "Because they're there!" says Emory chemist Douglas Mulford. Photo by Carol Clark. It’s that time of year again when Peepus Marshmalleous, commonly known as Peeps, pop up everywhere — even in an Emory University chemistry lab. Watch a brief video summarizing the show, below. 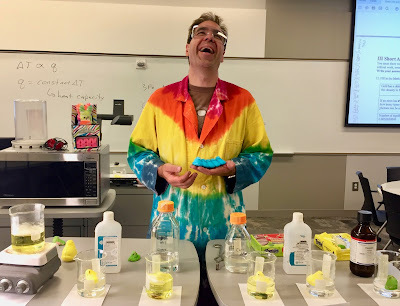 And check out Emory’s new Instagram account, Science Seen, for more quick, behind-the-scenes looks at science at Emory. 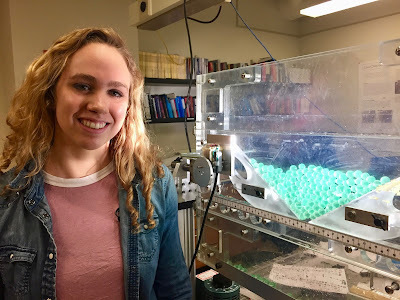 Emory sophomore Mia Morrell conducted the experiments with hydrogel balls. "You can learn a lot from them because they provide a simple model for physics, kind of like fruit flies do for biology," she says. For decades, scientists have studied how groups of solid objects — everything from falling grains of sand to a rushing crowd of panicked people — can get stuck as they try to pass through a small opening. The classic result is known as “faster is slower.” When the objects flow out, if an arch of the objects forms across the opening, then a large pressure can stabilize the arch and cause a clog. Now scientists have shown that when the objects are squishy instead of solid, the reverse is true. The journal Physical Review E published the findings by physicists at Emory University, demonstrating that when soft particles feel a larger pressure, they squish together and the arch breaks, and so clogging is less likely. Questions about how clogs form have implications for everything from improving highway design and the flow of traffic to avoiding jam-ups of people fleeing a burning building. The dynamics of soft objects that the Weeks lab investigated could give insights into biological processes such as the flow of cells, bacteria and other “squishy” particles through blood vessels. "Hydrogels have interesting properties and that makes them fun to work with," says Mia Morrell, a member of the Weeks lab. Weeks, who specializes in the study of soft condensed materials, became intrigued by the growing number of studies on how solid objects clog. It sounds counterintuitive — after a rush of solid particles through an opening forms an arch, greater pressure behind them solidifies that arch. But the process appears to work similarly to a keystone arch in architecture: The pressure from the weight of stones above presses the stones in the arch below more firmly together. Weeks and his students decided to explore the process of soft-particle clogging. Graduate students Xia Hong and Meghan Kohne worked on experiments involving tiny oil droplets and then computer simulations. 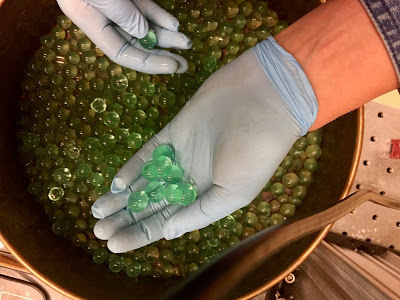 Motivated by those preliminary results, Emory senior Haoran Wang (who graduated in 2017) conducted early experiments with the marble-sized, water-filled hydrogel balls. They are sometimes called plant balls since they are commonly used to hold up stems in flower vases. Wang built a two-dimensional, Plexiglas hopper that allowed gravity to pull the hydrogel balls down through two triangular wedges that could be adjusted in width to change the size of the opening between them. Mia Morrell, a sophomore, continued the work when she joined the Weeks lab last year. 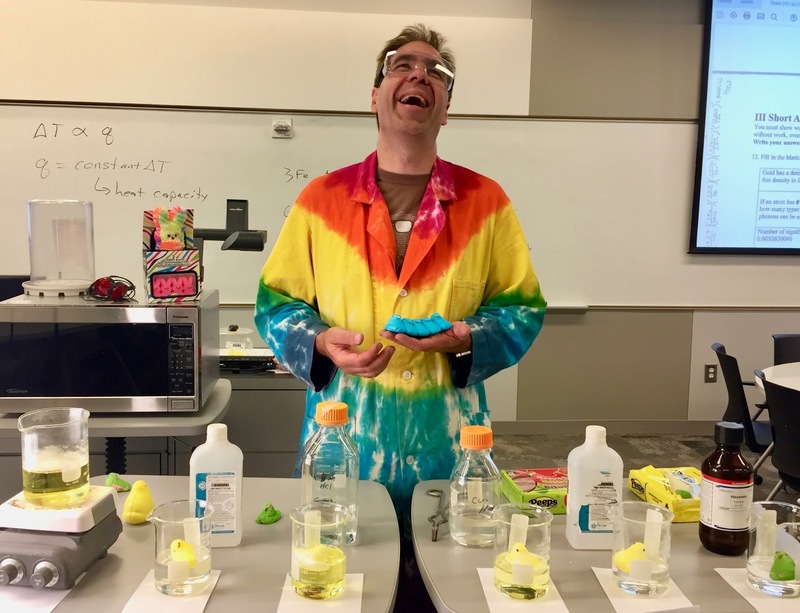 “I loved doing the hydrogel experiments because it’s really hands-on — not just sitting at a desk,” Morrell says, adding that the project also required her to learn how to become handy with a drill and a laser cutter. The hydrogel balls start out as deflated polymer husks. They are left in a tray of water until they swell up into squishy, slippery, plastic spheres that feel almost like living tissue. Morrell loaded the hydrogels into the two-dimensional hopper. She tilted the hopper to vary the effects of gravity and checked to see if the particles would clog as they flowed through it. This process required her to reload the hopper more than 400 times to investigate different conditions. The Hertzian force law, an 1882 formula by Heinrich Hertz, allowed the researchers to measure the displacement and compression force of individual hydrogel spheres and compare the hydrogel results with the oil droplet experiments and the computer simulations. The comparison showed that these different systems all have the same physical behavior, apparently universal to soft particles. Emory's Stuart A. Rose Manuscript, Archives and Rare Book Library holds an 1881 original edition of "Frankenstein" and an 1831 edition, above, with a depiction of the "creature" and a prologue by Mary Shelley. 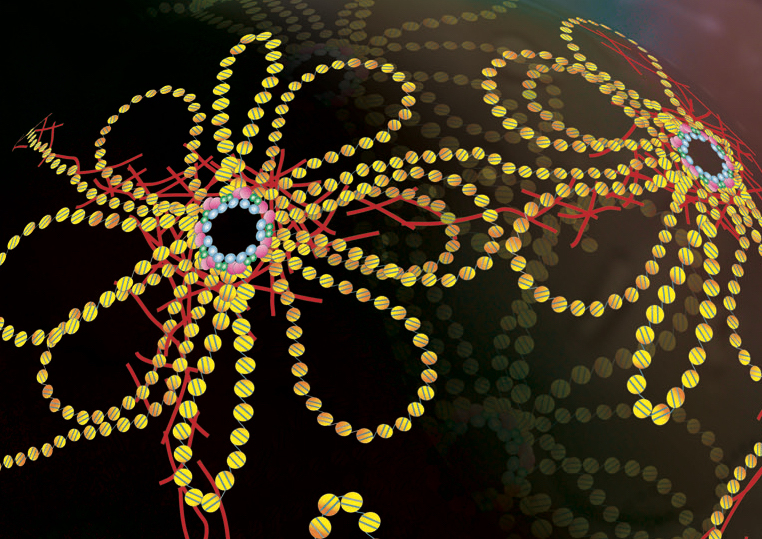 Interior of a cell showing the nucleus with the chromatin fiber (yellow) arranged in the three-dimensional space by loops formed by the CTCF protein (shown in pink). DNA is represented by thin blue lines on the chromatin. Graphic by Victor Corces. Scientists discovered another key to how DNA forms loops and wraps inside the cell nucleus — a precise method of “packing” that may affect gene expression. The journal Science published the research by biologists at Emory University, showing that a process known as hemimethylation plays a role in looping DNA in a specific way. 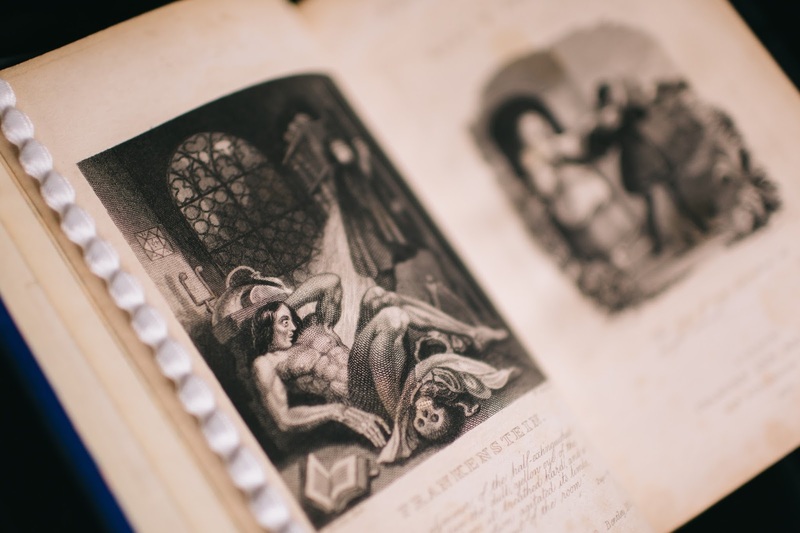 The researchers also demonstrated that hemimethylation is maintained deliberately — not through random mistakes as previously thought — and is passed down through human cell generations. Chenhuan Xu, a post-doctoral fellow in the Corces lab, developed experimental methods for DNA methylome mapping to conduct the research for the Science paper. Chromatin is made up of CTCF and other proteins, along with DNA and RNA. One role of chromatin is to fold and package DNA into more compact shapes. Growing evidence suggests that this folding process is not just important to fit DNA into a cell nucleus — it also plays a role in whether genes are expressed normally or malfunction. The Corces lab specializes in epigenetics: The study of heritable changes in gene function — including chromatin folding — that do not involve changes in the DNA sequence. DNA methylation, for example, can modify the activity of DNA by adding methyl groups to both strands of the double helix at the site of particular base pairs. The process can be reversed through demethylation. As cells divide they make a copy of their DNA. In order to do so, they have to untangle the two strands of DNA and split them apart. Each parental strand then replicates a daughter strand. “When cells divide, it’s important that they keep the methylation the same for both strands,” Corces says, noting that altered patterns of methylation are associated with cancer and other diseases. Hemimethylation involves the addition of a methyl group to one strand of the DNA helix but not the other. Some researchers observing hemimethylation have hypothesized that they were catching it right after cell division, before the cell had time to fully replicate to form a daughter strand. Another theory was that hemimethylation was the result of random mistakes in the methylation process. The methods developed by Xu in the Corces lab allowed the researchers to observe hemimethylation on DNA in human cells in real-time before, during and after cell division. They also mapped it as the cells continued to replicate. The researchers found that hemimethlyation only occurs near the binding sites of CTCF — the main protein involved in organizing DNA into loops. And when CTCF makes a loop, it does so by binding ahead, going forward in the DNA sequence, they observed. "We showed that by tuning the growth and death rate of bacterial cells, you can clear small populations of even antibiotic-resistant bacteria using low antibiotic concentrations," says biophysicist Minsu Kim. His lab conducted experiments with E. coli bacteria (above). Small populations of pathogenic bacteria may be harder to kill off than larger populations because they respond differently to antibiotics, a new study by Emory University finds. The journal eLife published the research, showing that a population of bacteria containing 100 cells or less responds to antibiotics randomly — not homogeneously like a larger population. 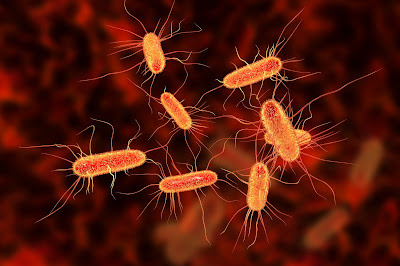 “We’ve shown that there may be nothing special about bacterial cells that aren’t killed by drug therapy — they survive by random chance,” says senior author Minsu Kim, an assistant professor in the Department of Physics and a member of Emory’s Antibiotic Resistance Center. Jessica Coates, as a graduate student at Emory, and Bo Ryoung Park, a research associate in the Kim lab, are co-first authors of the paper. Additional authors are graduate student Emrah Simsek and post-doctoral fellows Dai Le and Waqas Chaudry. The researchers developed a treatment model using a cocktail of two different classes of antibiotic drugs. They first demonstrated the effectiveness of the model in laboratory experiments on a small population of E. coli bacteria without antibiotic-drug resistance. In later experiments, they found that the model also worked on a small population of clinically-isolated antibiotic-resistant E. coli. Antibiotic resistance is projected to lead to 300 million premature deaths annually and a global healthcare burden of $100 trillion by 2050, according to the 2014 Review on Antimicrobial Resistance. The epidemic is partly driven by the inability to reliably eradicate infections of antibiotic-susceptible bacteria. For decades, it was thought that simply reducing the population size of the bacteria to a few hundred cells would be sufficient because the immune system of an infected person can clear out the remaining bacteria. It was not well understood, however, why treatment of bacteria with antibiotics sometimes worked and sometimes failed. Contributing factors may include variations in the immune responses of infected people and possible mutations of bacterial cells to become more virulent. Kim suspected that something more fundamental was a factor. 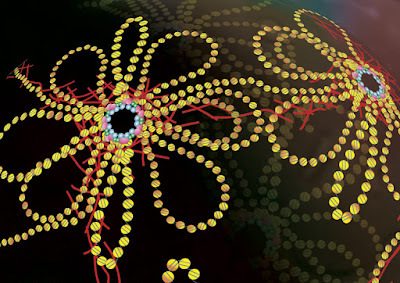 Research has shown unexpected treatment failure for antibiotic-susceptible infections even in a simple organism like the C. celegans worm, a common model for the study of bacterial virulence. By focusing on small bacteria populations, the Emory team discovered how the dynamics were different from large ones. Antibiotics induce the concentrations of bacterial cells to fluctuate. When the growth rate topped the death rate by random chance, clearance of the bacteria failed. The researchers used this knowledge to develop a low-dose cocktail drug therapy of two different kinds of antibiotics. They combined a bactericide (which kills bacteria) and a bacteriostat (which slows the growth of bacteria) to manipulate the random fluctuation in the number of cells and boost the probability of the cell death rate topping the growth rate. Not all antibiotics fit the model and more research is needed to refine the method for applications in a clinical setting. If you’ve ever told Siri to call your friend Bob and she answers with, “Calling cops,” you’ve seen the instability of artificial intelligence (AI) in action. Those mistakes are the limitation of the AI technology known as deep learning. They arise from the design of the deep neural network, as well as the network’s “training,” which applies mathematical optimization methods to massive amounts of data rather than hand-crafting rules to accomplish a specific task. 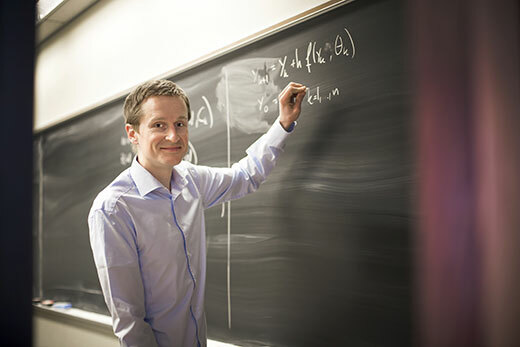 Emory mathematician Lars Ruthotto has dedicated his research to modeling and solving such 21st century problems with the innovative use of differential equations that date back to the late 1600s. The National Science Foundation has rewarded his efforts with a CAREER Award, its most prestigious honor for junior faculty. Put simply, Ruthotto is pioneering a new field — combining applied math, engineering and computer science — that applies the logic of differential equations to refine the chaos of deep learning. The award is recognition of the new knowledge Ruthotto and his students are creating in the emerging field and also a hint of what’s to come, says Vaidy Sunderam, chair of Emory's Department of Math and Computer Science. “This grant establishes Emory as a research and education pioneer in innovative methods for robust deep learning, a key technology in the coming AI decade,” Sunderam says. Read more in Emory Report.